As we reach the middle of 2013 our colleges are conducting graduation ceremonies and our in debt seniors are looking for jobs. Too many of our graduates are having a difficult time. The US economy is growing slowly, but this recovery is different from previous recoveries. Top line unemployment has fallen because of the substantial growth in low-income and part-time jobs. However, such low paying jobs are not the type of entry-level positions our college graduates seek and are qualified for. Many of the new jobs have compensation so low that the employees become entitled to negative income taxes. Twenty-four million people are either unemployed, have given up looking for work or have accepted part-time employment. These are the unemployment ranks which our graduates are joining. The number of people collecting welfare is growing. There is a serious risk that American capitalism is being converted under President Obama into a new form of socialism which is eerily similar to European socialism. Because of the failure to stimulate the economy and create tax-paying jobs, the National Debt is growing at a faster rate than the GDP. Non-income-tax-paying jobs, that offer negative income taxes, grow the GDP, but they also grow the National Debt. Our transportation infrastructure is decaying because a large number of our cities and states are insolvent and Congress is not supplying adequate assistance. The author of this article in his book, “Perpetuating American Greatness After The Fiscal Cliff”, has proposed federal tax law changes to permit the sale of Jump Start America Bonds to enable and encourage our international corporations and wealthy individuals to invest in infrastructure spending. Few members of the decimated middle class are participating in the recovery. Many of them have lost their jobs and their homes. Obamacare is encouraging part-time employment and many employees have or are going to lose their health care coverage. The IRS, which will have major responsibilities under Obamacare, has become politicized and too few Americans are outraged. The acknowledged wrong-doing has been permitted by the Obama administration to continue for years. Housing prices have seen a small increase because of purchases by investors, while young families remain in large part as renters. Austerity being fostered by the Sequester is the wrong remedy and is harming the economy. The Obama administration has lost control over its ability to stimulate the economy because it refuses to deal with our out-of-control entitlements which are becoming worse under Obamacare and because it has failed to deal with the scandals which have caused a decline in President Obama’s approval ratings. All jobs are good, but some are better than others. A part time job at or near the minimum wage for a high school student or drop-out can be a good job for such person. Hopefully, it will lead to advancement. The low-income employee can be expected to promptly spend all of the take home pay which increases the GDP. However, such spending, mostly on food and clothing, creates only a minimal and meaningless multiplier effect and the low compensation results in the payment of negative income taxes. Other jobs that pay salaries that require the employee to pay federal income taxes are much more desirable from a macroeconomic prospective. Individuals with tax-paying jobs buy cars, homes and other products and services, while people with low paying jobs generally do not. The increase in demand for such products and services leads to hiring additional workers and capital spending each of which generates additional tax-paying jobs. The greatest failure of the Obama stimulus programs is that they failed to create enough federal income tax paying jobs. A large portion of the tax rebates was used to reduce debt and created no jobs. The effect of Obamacare on employment is only beginning to be understood. It seems to be encouraging part-time jobs (to avoid Obamacare requirements) that are reducing head-line unemployment but are not materially increasing aggegate payrolls or federal income tax revenues. Welfare spending improves the lives of the recipients, but does not create many tax-paying jobs. Food stamps are generally spent at groceries or discount stores that might hire a clerk or two in a low-paying job. Farmers, overseas clothing manufacturers and their supply chains increase their sales, but hire few additional domestic workers. Insignificant tax revenue increases result from welfare spending. The GDP goes up on a better than 1 to 1 ratio because all of the welfare payments are spent almost immediately and the added low income wage earners spend their earnings. However, since almost no federal income tax revenues are generated, the National Debt grows by a large percentage of the welfare payments. The size of the National Debt matters. It is true that as long as short term interest rates remain near zero, the carrying cost of the National Debt remains negligible. However, if short term interest rates rise so will the carrying cost of the National Debt. Transportation infrastructure construction projects create good tax-paying jobs. The states are broke and must balance their budgets. They are unable to obtain funding for such projects. As a result, funding for such projects must come from the US government or other sources. The Obama stimulus programs should have allocated hundreds of billions of dollars for transportation infrastructure construction loans or subsidies. Instead the money was spent in ways that didn’t generate tax revenues. We still need hundreds of billions of dollars to be spent on transportation infrastructure construction. The Obama administration has called for a new stimulus program for a fraction of the amount needed. There is a zero chance that the Republicans in the House of Representatives will approve such spending. The President squandered his chance to adequately finance transportation construction during his first two years in office. He blamed all of his economic failures on the policies of George W. Bush and the refusal of Republicans to cooperate. As a result of the multiple scandals, confusing and misleading statements about Obamacare and disgraceful theatrics in dealing with the sequester, President Obama and his advisors have lost a great deal of credibility among voters. Now, ridiculous arguments by Republicans favoring austerity measures, like the sequester, that is causing harm to our economy, seem more credible to voters. Too many people think our economy is growing and it is time to try to reduce deficit spending. 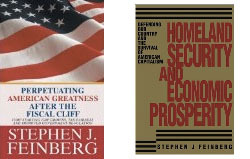 My book, Perpetuating American Greatness After The Fiscal Cliff introduces Jump Start America Bonds. Such bonds that will be purchased by corporations and indviduals will have tax features that enble them to be purchased virtually risk free. They will enable the funding of hundreds of billions of transportation infrastructure construction projects. Such bonds will only come into being if Congress changes the federal corporate and individual estate tax laws to permit and encourage their sale. The required changes will be revenue generating for the US Treasury almost immediately. They should sail through Congress and be signed into law by the president. As I have previously written on this website, Jump Start America Bonds represent the perfect economic stimulus. Housing construction and renovation are another source of good income tax paying jobs. The great wealth of private equity and foreign investors appears to have temporarily stabilized the housing market. A limited number of good tax-paying jobs are being created and auto sales have benefitted. Nevertheless, the foreclosed homes have devastated the middle class and increased bank losses. An increase in home prices means that some homes are no longer underwater, but the recovery in prices is not yet significant. It may not continue if mortgage rates keep going up. Single family homes are not suited for the rental market. There is a better way to help the housing recovery. It entails giving mortgage relief to homeowners as described in my book Perpetuating American Greatness After The Fiscal Cliff. This entry was posted in economic stimulus, economics, entitlements, federal deficit, government stimulus, income tax, macroeconomics, National Debt, Uncategorized on June 6, 2013 by sjfeconomics.